sean.obrien added a comment to T688: Rename PureBrowser to Firefox. @jonas.smedegaard yes that does seem to be the case. it's worth questioning our assumptions in cases like this, and luckily I had just been in a discussion about this very thing with a PureOS user, looked up the policy, and can't find anything restricting us from doing that. I will contact Mozilla on Friday trademark-permissions@mozilla.com if there are no objections, but it's best to let this sit for a while. copypasta from my comments in a Matrix room, but TL;DR let's just rebrand it back to Firefox, I'm pretty sure Mozilla will give us its blessing to do so. sean.obrien added a comment to T686: Update Etcher / LiveUSB instructions. sean.obrien created T686: Update Etcher / LiveUSB instructions. sean.obrien added a comment to T156: purebrowser - default search engine tracks users. sean.obrien added a comment to T595: PureBrowser detected as incompatible with Firefox add-on store. sean.obrien added a comment to T644: PureOS is not privacy-protecting enough by default. When I first suggested this in the other issue, these addons were just suggestions, not a "must have" list. sean.obrien edited the content of Firefox Compatibility Mode. sean.obrien renamed Firefox Compatibility Mode from "Firefox Compat Mode" to "Firefox Compatibility Mode". thx @jeremiah.foster for opening this. sean.obrien updated subscribers of T595: PureBrowser detected as incompatible with Firefox add-on store. sean.obrien added a comment to T347: Make it easy to start Tor Browser Bundle. thanks @mladen.pejakovic that is helpful. I made some slight wording changes to the warning so we don't scare away users. I'll be working with Jeremiah on this to see if we can come up with a smoother solution, but this wiki entry is much needed in the meantime. sean.obrien edited the content of TorBrowser on PureOS. sean.obrien added a comment to T594: Decide how to handle phone-specific syncs from Debian unstable to PureOS. @sean.obrien (this might become a bit off topic): the flatpak side needs more work for the 3rd party apps. @guido got it, thanks! The further we can think down the road the better, so if I can be of any help let me know. I'm not yet sure what else might be necessary / desired by devs for mobile app development. Anything we can do to make developing apps for the Librem phone smoother is really important. Does it make sense at this point to author a strategy / procedures for packages like this? Maybe a separate repo for unstable packages that we want to make available on PureOS as quickly as possible to encourage Librem phone development? I'm still getting my feet wet, so perhaps some of this is worked out already. A thought - If the issue is PureOS/Purism governance, then maybe we just take the TB downloader package from Debian contrib and start maintaining it in-house, making sure we have someone tracking changes in upstream TB very closely so we don't lag behind, and building a good relationship with Tor Project where we give them a heads up that we're doing this. We should also build a relationship with the Debian package managers for that downloader script... it's quite possible they're happy for us to be the maintainers for Debian contrib as well. But maybe not. Is it in your opinion more important to fix immediately (i.e. no time to wait for PureOS, we must hand over the keys to the castle to upstream) bugs in Tor Browser, or do you find it equally important that we (as they become available) enable mechanisms for the Linux developers and GNOME developers and any other upstreams to address 0-days in their code? Let me rephrase: The Tor Browser launcher/downloader *has* been packaged for Debian. I believe it has lagged behind in updates, even in my past experience, but I would want more concrete information on that. I do not recommend that PureOS bypass Debian and pull directly from upstream - either as PureOS-specific development effort (a package) or by our users (a script like torbrowser-bundle). The amount of work is less but we loose the security tracking and wider use (more eyeballs) from Debian. In my opinion, this issue should be solved by packaging Tor Browser for Debian main. sean.obrien added a comment to T421: Need a reference document for packages with external sources. sean.obrien added a comment to T553: unspecified when a PureOS issue is truly "resolved". What do we need to do to move this forward? We really need to have Tor Browser available in some form. @jonas.smedegaard I know we've had some discussions about software outside of PureOS repo in general. What's your suggested solution for shipping TBB (or do you suggest not shipping it)? sean.obrien added a comment to T596: PureOS should make it easy to include similarly-free external resources. Others than me in Purism/PureOS are happy about Flatpack - doesn't that provide the needed sidechannel for injecting these popular tools? Last fall, soon after I was hired to Purism and my interest in nitpicking and policy making became clear, I was tasked with tracking "Freedom issues" - i.e. make sure PureOS would comply with FSF FSDG. Instead of simply "obey the gospel of FSF", I tried make sense of their rules and find the logic that make sense to me that PureOS follows - which happens to fit FSF rules but makes sense on its own as well. The rule I have followed - which FSF does not dictate but in my interpretation fits their concretely written rules - is that PureOS must be responsible towards our users in what we offer them. My guess is that FSF has peculiarly odd phrases like "Nor should the distribution refer to third-party repositories that are not committed to only including free software; even if they only have free software today, that may not be true tomorrow" is that they don't trust other organisations (e.g. Debian) to stay on the rght path, but they do want other organisations to trust them (e.g. 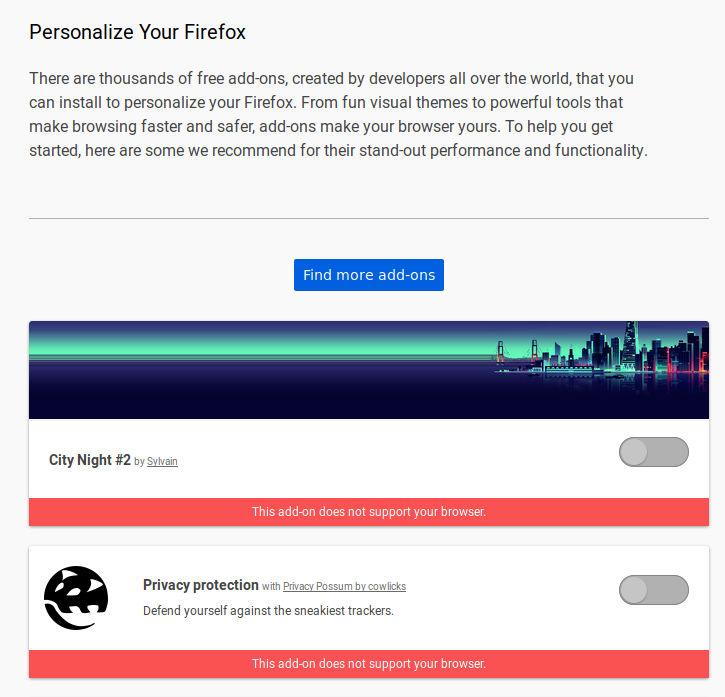 use their list of Mozilla-compatible addons). Thanks @jonas.smedegaard ! Potentially this is a bad forum for this discussion but I appreciate the title change. I'll add really quickly - if Debian main is still considered problematic, I understand, but I don't think that precludes making some of the Electron-based clients for E2EE messaging available through their repos (though not marked by default). sean.obrien added a comment to T550: purebrowser need a start page. Such change(s) would be encouraging those resources. Since those resources are external to us, we cannot ensure our users that they fit our constraints e.g. regarding software freedoms - and even if they happen to currently align with out constraints we have no way of intervening if that change later on, after our users have installed our system onto their systems. PureOS is the subset of Debian which is "Free" both by Debian definitions and by Free Software Foundation definitions. Encouraging inclusion of Debian resources would - in the eyes of FSF - be encouraging non-free stuff, and we would loose the endorsement from FSF as being a Free system by their standards. sean.obrien added a comment to T575: Encrypted disk not found during boot. I had this issue on the OEM version of PureOS 8 Beta 1, Librem 15 v3. I ended up doing a full reinstall of PureOS. sean.obrien created T596: PureOS should make it easy to include similarly-free external resources. sean.obrien created T595: PureBrowser detected as incompatible with Firefox add-on store.